Diversification breeds strange bedfellows, as many a modern corporation has found -- occasionally to its sorrow. Niagara Mohawk has had the experience in reverse, tracing its corporate ancestry to a wide variety of enterprises which shared only the common factor of being involved with power. No antecedent of the company was more colorful than a small steam railroad acquired along with a company which operated a pulp mill on the Racquette River near Potsdam. The Hannawa Falls Water Power Company was its name and it joined Niagara Mohawk by a course as circuitous as the route of the railroad it operated. Niagara Mohawk records indicate only that the Hannawa Falls Water Power Company was incorporated on March 30, 1899. It acquired certain property and rights on the Racquette River and owned and operated a hydro-electric plant at Hannawa Falls. The original directors and stockholders were W. B. Cogswell, E. A. Merritt, Jr., O. H. Tappan, J. S. King and W. C. Johnson. The company was in receivership from 1902 to 1913 although it purchased the capital stock of The Potsdam Electric Light and Power Company in 1903 and continued to supply power to the Canton Electric Light and Power and others. It was reorganized in 1913 by an agreement between the Hannawa owners and the aluminum company, under the terms of which Alcoa agreed to restore the Hannawa Company to a sound financial basis and transfer ownership and control of Hannawa and other companies to Alcoa's St. Lawrence River Power Company. This was preliminary to the 1924 consolidation of Hannawa and the original St. Lawrence Valley Power Corporation. The photographs speak volumes, yet they tell only part of the story. The line's purpose was to haul pulp from the mill to the railroad at Potsdam. The Hannawa Company ground wood pulp in addition to producing electricity. The tracks ran on almost every kind of support except balloons. 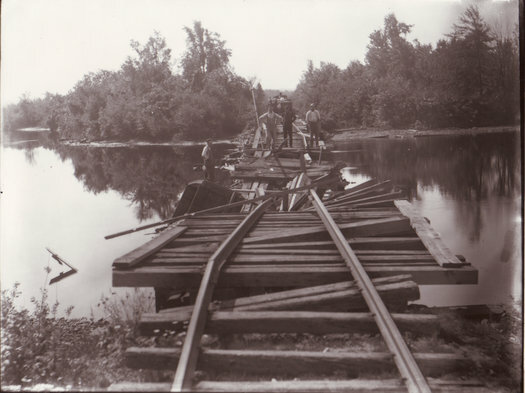 Rickety trestles wandered drunkenly back and forth across the river, seeking usable footing in the marshy bottom land. Crude stone dikes spanned hollows where the ground was solid enough to support them. Not a plush roadbed. The railroad never admitted it provided passenger service, yet it had many faithful customers. They were divided into three categories: the workers at the pulp mill; residents of Hannawa Falls village; and kids cadging a free trip on an unintentional roller coaster. And the railroad accommodated them all. It was, as our British cousins might put it, "a chancy trip." The engineer in charge of the tiny locomotive was sometimes known to impart an excess of zeal to her performance. This was not surprising. 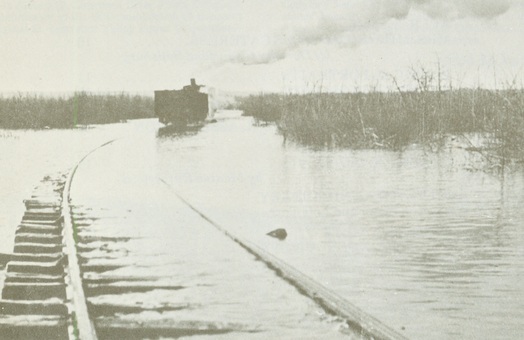 It took a special type of man to run a train over tracks which could sink below water level as the weight of the train pressed into the spongy soil. His enthusiasm was unchecked by the minor triumph of reaching Potsdam and solid footing. The track ran through the streets, and it is reported that one Sunday he demolished the corner of a church during the morning service. Records indicate that the directors of the Hannawa Company were also the directors of the Potsdam Red Sandstone Company, which operated the quarries on the west side of the river near the present Sugar Island Dam. The railroad also carried stone from these quarries. Hannawa Railroad train, taken by Glen Holden of Potsdam, about 1915. 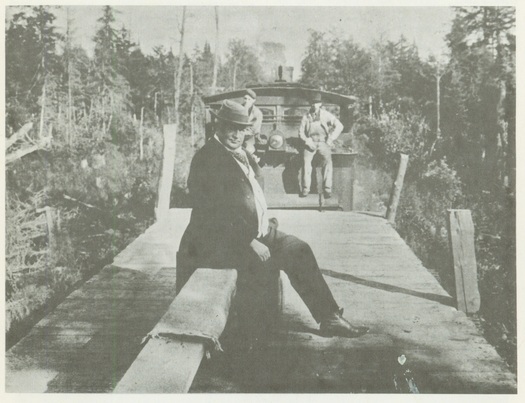 C. P. (Pete) Scheller, director of Hannawa Falls Water Power Co., stands on observation platform of "official car."